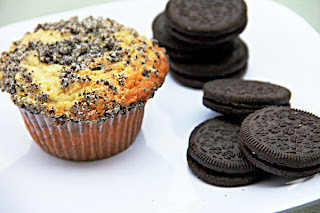 Taking Time for Mommy: Oreo Muffins - Delicious! My son loves muffins, if I haven't mentioned it before. I think I have 5 different kinds in the freezer right now. I make a batch, we eat them for breakfast, and they immediately go in the freezer. Works great! Then when he wants muffins again another day, he gets to pick what kind he wants. I take one out, microwave it for 30 seconds, and he get a warm muffin for breakfast! I saw this recipe on Knead for Speed, and knew I just had to make it. So when I had Oreo's left from making Oreo Stuffed Chocolate Chip Cookies, I knew exactly how to use them up. Because eating them straight out of the bag by the handful seemed like a bad idea. As much as I wanted to, I had to resist! Erin Sellin is a writer for Taking Time for Mommy, moderator of the Time 4 Mommy Foodie Group and owner of Dinners, Dishes, and Desserts. These looks wonderful. We love oreoes! These look so delicious that they should be illegal! I have a "problem" wwith Ore's; I've been known to eat the whole bag, so I keep them out of the house!